On July 1, 2008 volunteer urban gardeners, led by Rebar, began removing 10,000 square feet of turf from San Francisco’s Civic Center Plaza. 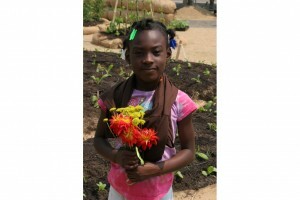 Over the course of the following two weeks, teams of volunteers transformed the site into a temporary food-producing garden. 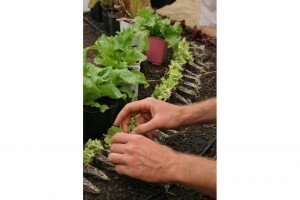 On July 12, over 250 volunteers transplanted thousands of seedlings into donated soil. 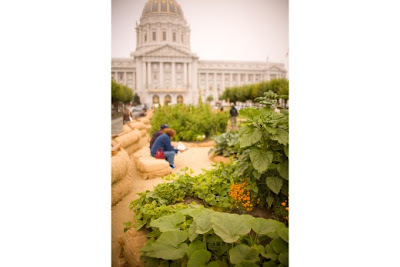 Wedged between San Francisco’s Civic Center, an area that contains many of the city’s largest government and cultural institutions, and the Tenderloin, a neighborhood shackled with significant poverty, homelessness, and crime, the garden stood as a true social and political experiment. 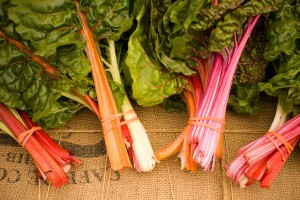 Within weeks, this new ‘Garden of Communities’ was producing approximately 100 lbs of fresh organic produce a week, all of which was donated to the San Francisco Food Bank, and subsequently distributed to meals programs throughout the City. Originally slated to be removed on September 21, Mayor Gavin Newsom requested that the Garden stay in place through Thanksgiving 2008. The Garden was part of a broader effort to reconsider the way we think about urban open space, transforming ornamental landscapes into productive landscapes. 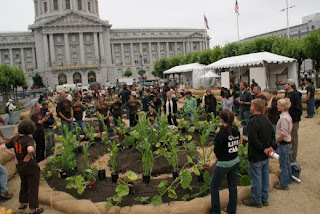 The project was a great success, but a temporary garden is not sufficient to achieve the fundamental change in the food system we seek. 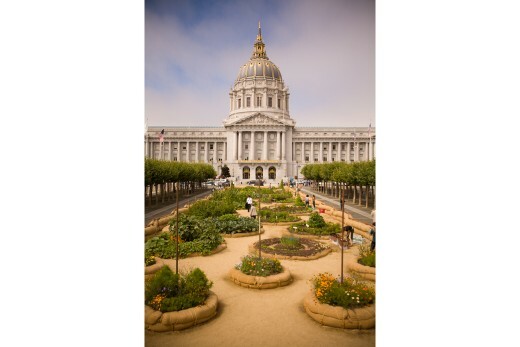 If the Civic Center Victory Garden truly succeeds, it will become a powerful symbolic gesture of both the political will in City Hall to support urban agriculture in San Francisco, and of the collective surge of interest in fixing our country’s broken food system. 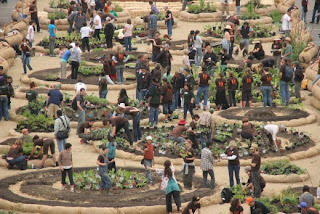 Numerous groups are at work in San Francisco and across the nation responding to rising fuel prices and food costs by getting their hands dirty and rebuilding the practice of local food production, building bridges between urban communities and the peri-urban and rural farm families that support them, and teaching young and old how to garden again. The Civic Center Victory Garden was built in collaboration with SF Victory Gardens, Slow Food Nation, City Slicker Farms, CMG landscape Architecture, and hundreds of community volunteers.